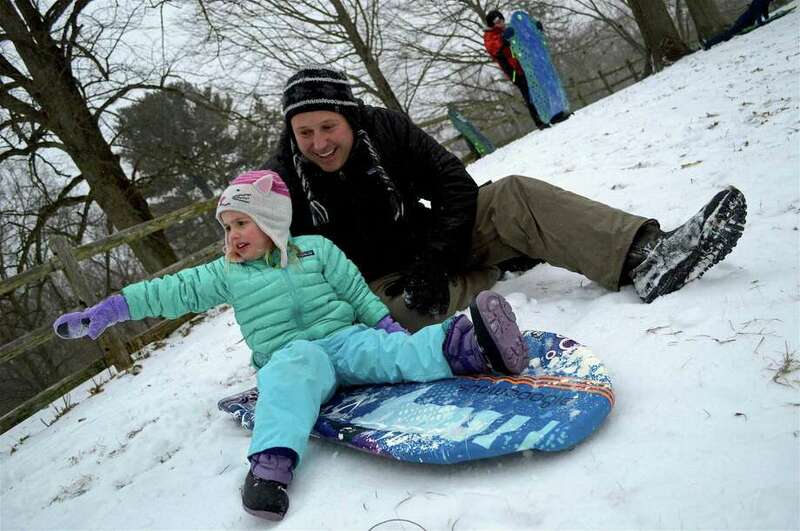 Chris Montanaro of Westport and his daughter Stella, 3, get ready to sled in the Baron's Land during the snowy day on Tuesday, Feb. 12, 2019, in Westport, Conn.
WESTPORT — An early decision for a snow day brought out some happy sledders Tuesday to the popular hill in the Baron’s Land, just west of Compo Road North by the Post Road. Roads were not great as snow continued to fall in the afternoon, but there were plenty of cars barreling along sometimes sludgy streets. On Main Street some stores stayed closed, but others had open doors and even periodic customers.